Recently I found myself in Putrajaya, attending a private meeting at a hotel in the locality. The last time I went to Putrajaya, it was about 5 years ago, and the public transport system for the area was almost non-existent apart from a few public buses. The only viable option at the time was to take a taxi from the train station. Even then, you had to wait a long time for a taxi to come along. You're certainly better off driving there. Things however have changed for the better. I saw plenty of buses and taxis queuing at the train station this time around. Definitely good news for those who work and live there, as well as for tourists visiting the administrative capital city of Malaysia. 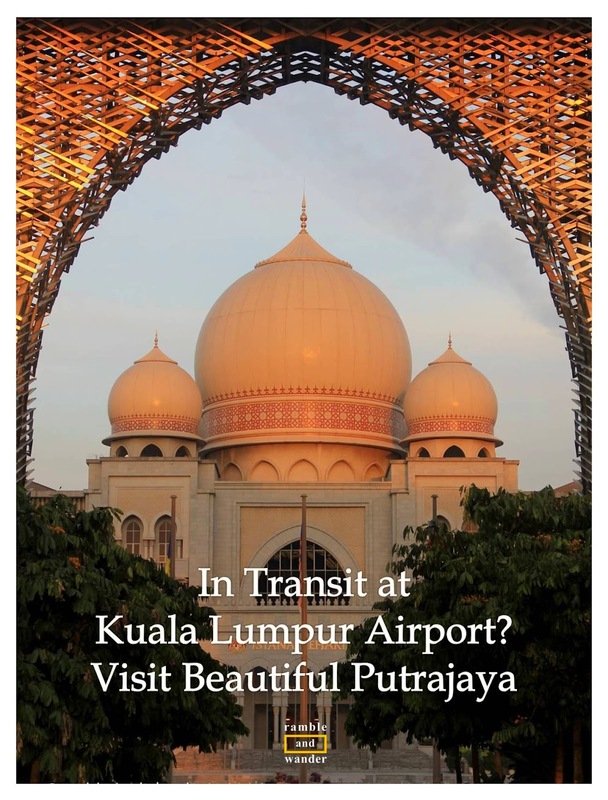 Using KLIA Transit train, Putrajaya/ Cyberjaya Station is about 20 minutes away from KL Sentral and about 20 minutes as well from Kuala Lumpur International Airport (KLIA). The train fares are MYR9.50 and MYR6.20 respectively. This means that Putrajaya could be a good option for those who are in transit at KLIA and have a few hours to kill before their next flight out but do not want to go all the way to Kuala Lumpur city centre. As I was already in Putrajaya, I took the opportunity to do a quick tour of Putrajaya from the train station. There's a pre-paid taxi service where you can buy a coupon from a booth at the train station to hire a taxi driver to drive you around for a fixed price based on the number of hours that you require. For a 2-hour tour, you have to pay only MYR75 for a budget taxi (using Malaysia's Proton Waja). Other options available are premier taxi service (e.g. Proton Perdana, MYR130) and executive service (people carrier, suitable for 5-7 pax, also at MYR130). Unfortunately I didn't have much time, so I asked for a 1-hour tour in a budget taxi which cost me MYR39. As I was travelling alone, I thought it's somewhat expensive, but at the same time I realised that if it's for 2 people or more, the rates quoted are quite reasonable. This taxi tour works on the concept where you decide on where you want to go and where to stop, subject to the time frame that has been agreed on and paid for before hand. For my tour, the first stop was Seri Wawasan Bridge (not seen in the photo) from where you can take a photo of the bridge as well as that of Masjid Putra (Putra Mosque) and the Prime Minister's Office which are located across the lake. From here, my driver took me to the next stop, which was Millenium Monument. From Millenium Monument, we headed to the nearby Masjid Tuanku Mizan Zainal Abidin, which was completed in 2009, and named after the then Supreme Head of Malaysia, the Yang di-Pertuan Agong Tuanku Mizan Zainal Abidin. Across the boulevard from the masjid is Putrajaya Corporation Office Complex and behind it is Palace of Justice, or what is locally known as Istana Kehakiman. View of Putrajaya from the masjid. From the masjid, we retraced our route and stopped by Ministry of Finance for a quick photo shoot. Below is the boulevard that runs in front of Ministry of Finance building. And from here we drove to Putra Square (or Dataran Putra) for a few more snaps of Masjid Putra and Prime Minister's Office, which is officially known as Perdana Putra. And lastly, another stop at Seri Wawasan Bridge to capture the sights on the other side of the bridge before heading back to the train station. Apart from a few other main attractions (including some bridges), I think I managed to cover a large part of major attractions in Putrajaya. For the rest, hopefully there would be another trip to Putrajaya soon. I hope to try the lake cruise as well the next time I'm in town. Putrajaya is also well known for its botanical gardens (yes, plural :-)) - which means that it is also a good place for a day trip, especially for families. How long did it take to cover all these sights? Believe it or not, it took me slightly over 1 hour, with just a few minutes to spend at each stop for some photo opportunities. At each stop, I was rushing over here and there trying to find a good spot for photos. My recommendation therefore is to take at least a 2-hour tour if you have the time, and definitely opt for a longer option if you prefer to take your time, wait for the right moment for photos, use a tripod, etc. If you have the time and are on a budget, you can take a public bus to get around from the train station and within Putrajaya. Each bus trip would cost you just MYR0.50. On weekends, there is an even better and cheaper deal for tourists. Putrajaya Corporation provides a 2-hour tour (twice daily on weekends) from the train station at a very minimal cost of MYR1 per person. No, it's not MYR10. It's just MYR1. Tickets are sold on first come first served basis. More info on this tour can be found here. One drawback of this tour is that there is a very limited number of stops where you can actually get off the bus to see some of the places. So there really isn't much of photo opportunities for budding photographers, unless if you are happy with taking photos from inside of the bus. Apart from that issue, it's highly recommended. 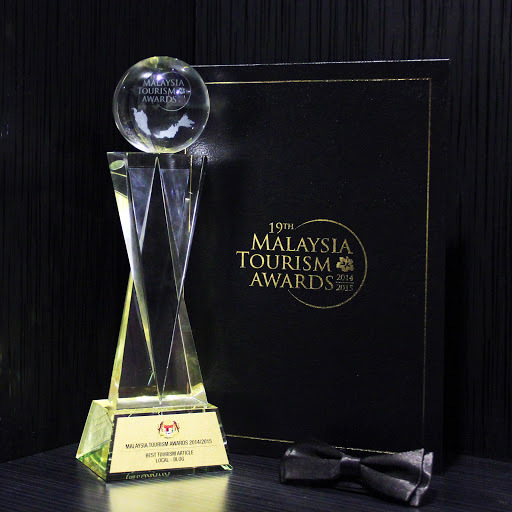 Travelling to Kuala Lumpur and still looking for an accommodation? gambo mahkamah tue yang bersama arch, sekali tengok macam taj mahal. good angle! Hihi, thanks. Unfortunately (or fortunately?) that was the only angle of view that I had of Palace of Justice. We didn't actually stop in front of the building because of the time constraint. I just took the photo from the "overhead" bridge connecting Masjid Tuanku Mizan and Putrajaya Corp Office Complex. Hmmm.. Driving to n fro Putrajaya so many times but it never looks this attractive n inviting..i don't even know Masjid Tunku Mizan exists..i'm so ignorant..
Haha, Farikica! No, I don't believe you're ignorant. It's just that sometimes in our busy daily life, rushing here and there, we tend to forget to stop and take a breather for a bit, which is when perhaps we can enjoy this kind of views. Actually I had wanted to join the free Heritage Walk Tour which covers the areas surrounding Central Market in KL (including Chinatown if I'm not mistaken) but it's not opened to locals *sigh* Have to do it on my own, I guess. ..:) I thought u're going to Europe again in the near future, right..? It had been so long since i went to Chinatown. 10 yrs, 8 year ago...? After i started working, bought a car, then i stop going to all those crowded places.... Oh, Malaysia also has Walking tour ya..? Similar to the one in London, I presume..
Re: Europe; Yes, most likely but I have not finalised anything just yet. Re: Walking tour; I'm sure there are plenty in KL but the one offered at Central Market (Heritage Walking Tour) is free - although apparently it is opened to foreigners only. It's a bit like saying locals are not allowed to join to learn about their own heritage. Wow, that's Putrajaya?! To think of it kan, I've been there once before moving to Dubai and that's it.. should make a point to go again la, this time take the kids along.. Thanks for the compliment, Danny. Yours are no less nice and awesome too :-) Yup, I wish I could have more time to spend to go inside Masjid Besi and Masjid Putra too. Next time, perhaps. Wow! What gorgeous photos. The Palace of Justice looks absolutely stunning. Yup, it's a shame that I had to leave early. If I had more time that day, I would have stayed back and explored more of what Putrajaya can offer. I'd probably take or allocate one afternoon or even one whole day perhaps the next time I'm in town. 4 buildings toward PICC - 4 kementerian actually . Kementerian kemajuan luar banda & wilayah, kementerian penerangan komunikasi kebudayaan, kementerian perumahan kerajaan tempatan and the last one kementerian pembangunan wanita keluarga & masyarakat. Hope u capture it next time. If u stay in pullman hotel u can see it from there. Inspiration of building from bunga kantan to songket .. Hihihi if people can figure it out lah.. Completed last year aug.
Saya setuju dengan pendapat bahawa setiap bangunan di sini mempunyai ciri2 yg tersendiri yg mengagumkan. Walau bagaimanapun mungkin terdapat juga pihak2 yg berpendapat ciri2 ini diambil lebih daripada negara luar berbanding dengan ciri2 dan unsur2 tempatan. Bagaimana dgn pendapat saudari? P/S: Saya kurang faham dengan komentari berkenaan menggunakan motif daripada industri itu sendiri. Boleh tolong jelaskan dgn lebih lanjut? wahhhhh!!! cantiknyeeeee all da pic!! i am admiring your photos ... u are really talented !!! and u make me love putrajaya even more !! I hope you would manage to do so too. Perhaps on the last day while waiting for your flight back? Putrajaya is not that far from LCCT. What a super awesome pictures that you have here, Sir. I shouldn't read this blog anyways, it makes me crazy to be in Putra Jaya soon. Lol :D.
Thanks for the tips, I will noted that. Can't wait to be there in this coming March, soon. See you there, if you still in Malaysia..:). may I join u guys?? Absolutely stunning pictures and great tips :) Thanks a lot! Yang saya tahu, terkini Putrajaya@Nadi Putra juga provide bas for Putrajaya Sightseeing.. The rate more cheaper MYR15 per adult and MYR 7 per child, tak silap saya... Starting point di Putrajaya Sentral. So kalau you from KLIA just take ERL to Putrajaya Sentral.